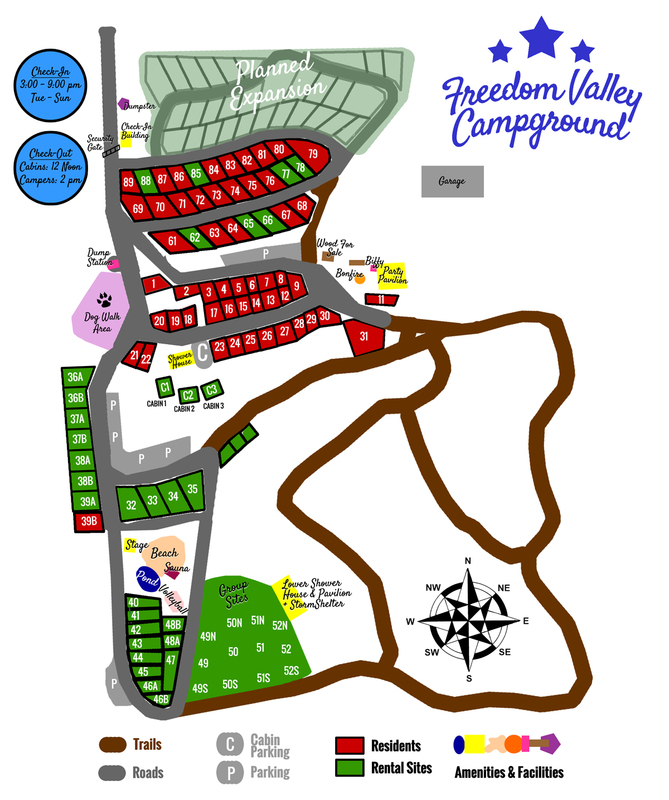 Freedom Valley is a 21+ adult-only clothing optional campground with tent sites, full hook-up RV sites, and camper cabins for rent. We are located conveniently near the Minnesota border in western Wisconsin near St. Croix Falls, Cushing, and Luck, WI. We are independently owned and not affiliated with any other lifestyle properties. At Freedom Valley Campground, our wish is to provide our guests and residents with an environment in which they feel the freedom to express themselves. In 2016, we expanded the number of sites, built an eco swimming pond, and added a stage for beachside entertainment! In 2017, we expanded the group area, added a solar shower, and more sites. In 2018, we increased the size of the main pavilion, added 4 more outdoor showers, and installed a new drainage field to prepare for future development. Stay tuned in 2019 for the next chapter of improvements! Thank you for considering Freedom Valley Campground for your next adult getaway or summer home-away-from-home. Early check-ins and late check-outs may be requested in advance and granted on a case-by-case basis for an additional fee. We are excited to announce that we plan to greatly expand our capacity in 2019! A new sewer system, bath facilities, and full hook-up lots for lease will be added... and we always think of some other project to improve your guest experience!